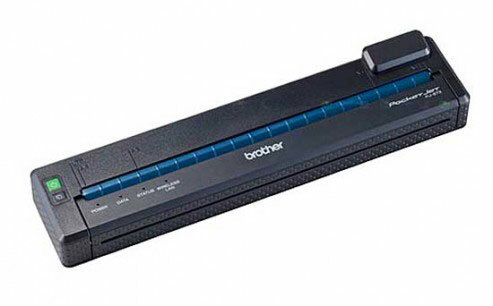 The Brother PocketJet 673 has been discontinued. No direct replacement is available. The Brother PocketJet 673 mobile printers feature high-quality printing for applications that require the best output for text and graphics. The PocketJet 673 printers, with 300 dpi resolution, provide a high-quality output while helping to lower the cost of mobile printing. Each printer comes standard with USB 2.0 and IrDA interfaces, and a Bluetooth wireless technology interface is available as an option. The PocketJet 673 mobile printers also have a number of advanced features to help improve overall performance: optional Lithium-ion battery for increased battery yield and longer battery life, Bluetooth Imaging Protocol support for downloading and printing JPEG files, the ability to store document overlays in the printer to minimize data transfer, and full-featured design software for creating and downloading the document overlays. PocketJet 6 PLUS KIT, 300 dpi, integrated USB/Wi-Fi (adhoc) "KIT" includes USB cable, Ni-MH Battery, AC Adapter/Charger/ 110V Cable, 100 Sheets Letter Size Thermal paper, Doc. Set and Carrying Pouch. * Requires iOS SDK for integration with iPhone and iPad, No support for AirPrint. LIMITED INVENTORY AVAILABLE WHILE SUPPLY LASTS! PocketJet 6 PLUS ENGINE, 300 DPI, integrated USB/Wi-Fi (adhoc) "ENGINE" is printer ONLY, without battery, Doc. Set, * Requires iOS SDK for integration with iPhone and iPad, No support for AirPrint. LIMITED INVENTORY AVAILABLE WHILE SUPPLY LASTS! Software for this unit was very inferior, especially for iOS. We also ordered brand new batteries for this unit, both were bad and Brother does not want to replace them. Their tech support routed me 4 different times to get to the right person. Found out the Brother set up for this unit is incorrect. Lots of frustration using it on a daily basis. I have to turn off/on wifi to get it to work.